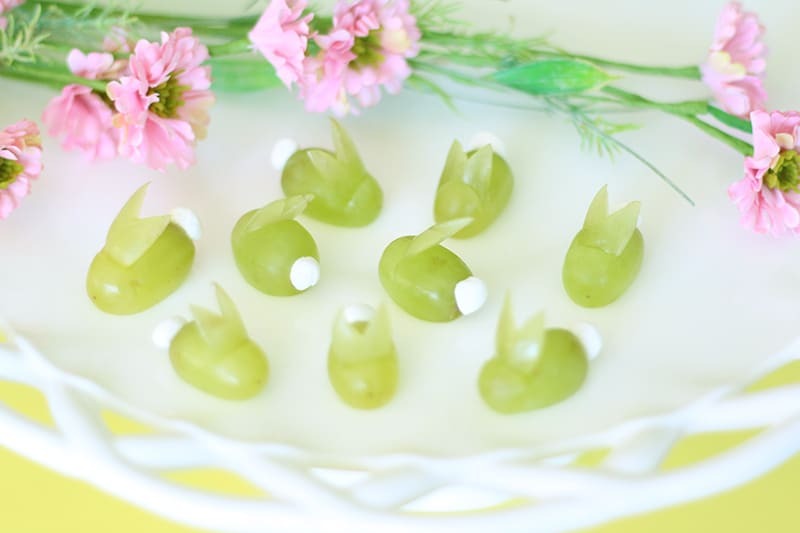 My friends, you have to surprise your kids and learn how to make grape bunnies for Easter, or actually just surprise them with some tomorrow morning before school, they are that simple to make. You don’t even need to add marshmallow tails, except how cute are marshmallow tails? When our waitress at the Asian Buffet, I know, I know, don’t be jealous of how glamorous we are, brought a few of these to our table with our fortune cookies, we all went nuts for them. They are just so simple and adorable, and healthy. 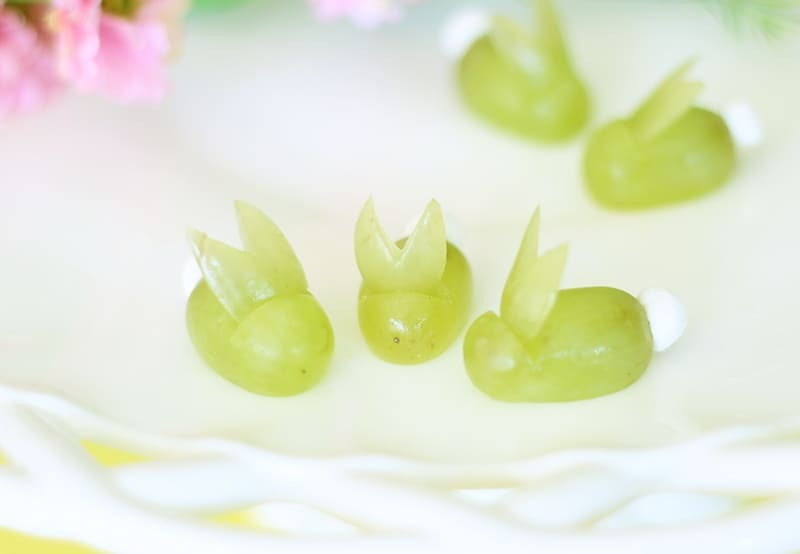 Read on for the simple instructions for how to make grape bunnies for Easter! 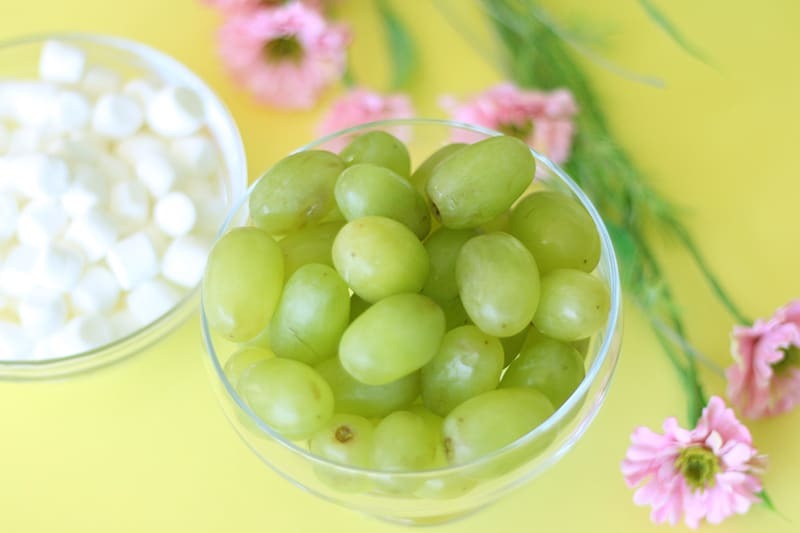 Start with some clean dry grapes, some mini marshmallows and your best small sharp knife. 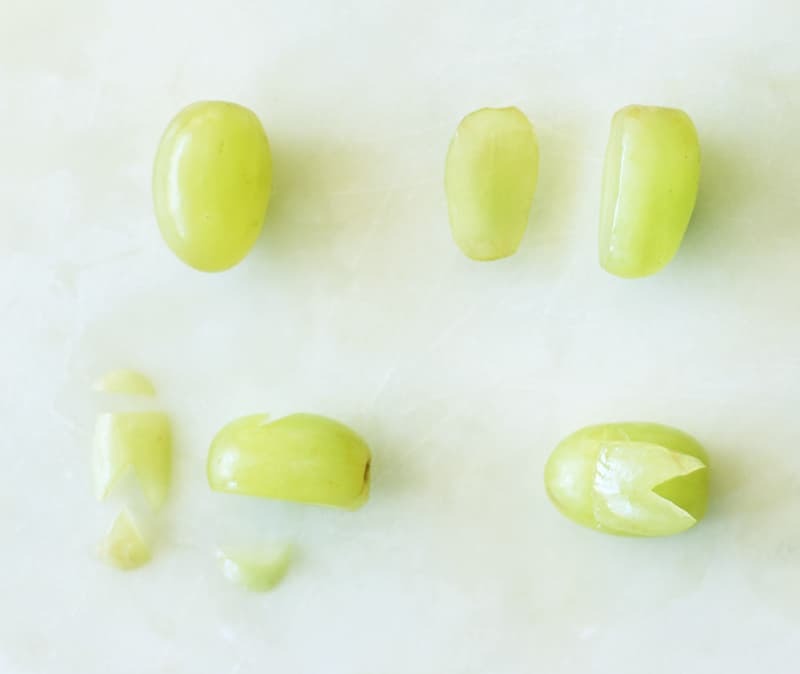 Take a grape and cut a small sliver off of one side. Cut one end of the sliver off. Cut a deep notch into the other end. This will be your bunny ears. 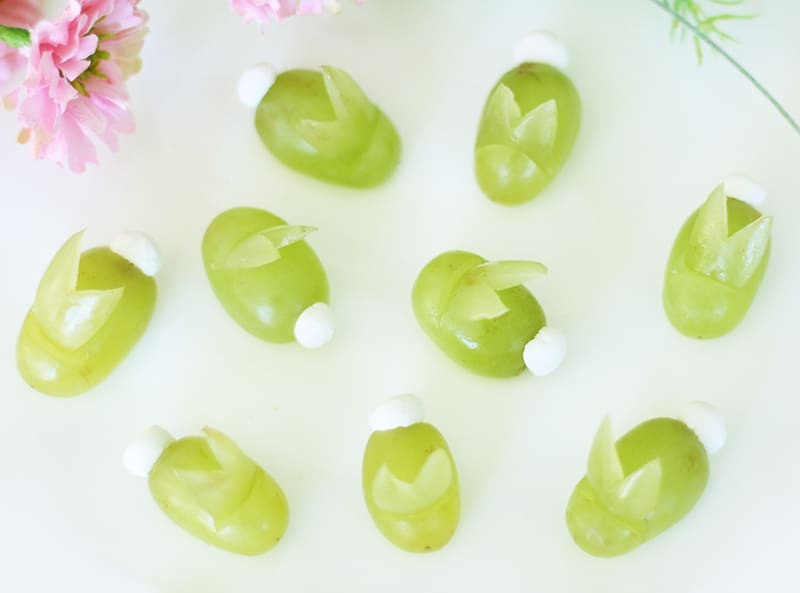 From your bunny body (the large part of the grape) cut a small wedge at a 45 degree angle. Slide the bunny ears into the notch! For a finishing touch, if you are feeling extra, cut a mini marshmallow into fourths and use the sticky side of one piece to adhere it to the bunny’s buns. Make a whole bunny farm! 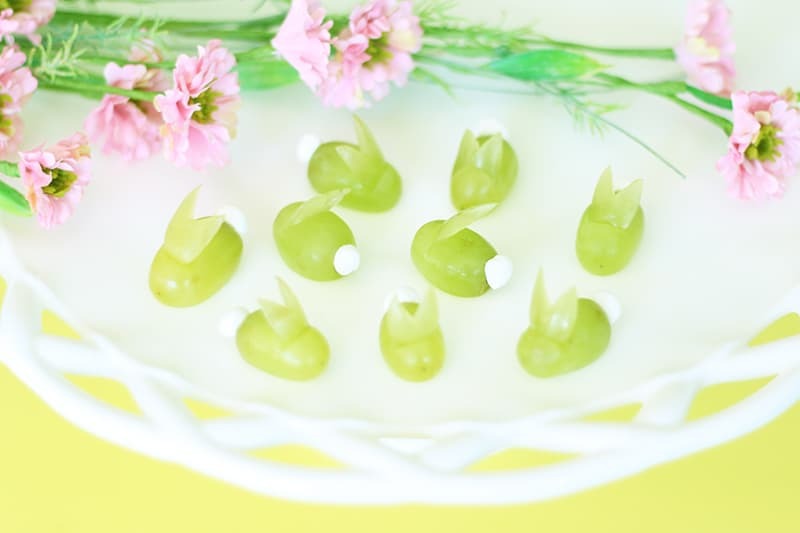 Next I’m going to make some olive bunnies. Won’t they be so cute on bloody mary’s for Easter brunch? It’s going to be adorable and festive and delicious. Visit our Easter Page for crafts, recipes, and more simple entertaining ideas. Thanks for sharing.This is adorable! 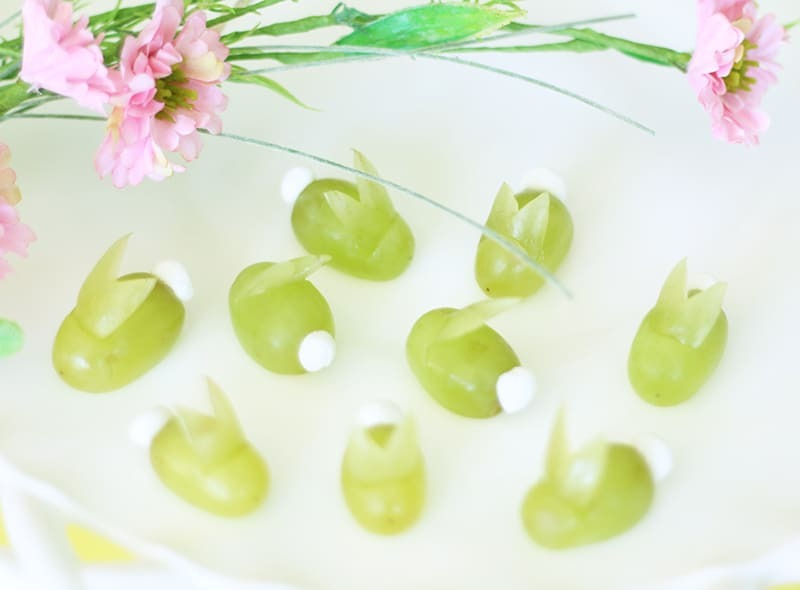 I am totally going to make them on Easter! Choking hazard. These are very cute but please, please, please don’t give them to kids.